The book I’ve been working on for more than 30 years, about my adventures practicing medicine in Rome, has been accepted for publication!!! 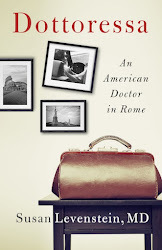 Paul Dry Books in Philadelphia, is planning to bring it out in spring 2019 under the title Dottoressa: An American Woman Doctor In Rome, and hopes to get it published in Italian some time thereafter. Paul Dry is a wonderful small independent publishing house, with focus on the intellectual and the quirky, and I’m proud to be in the company of its authors. The book is entirely independent of the blog – even assiduous blog fans will find it all new material. Congratulations. Can’t wait to see the finished product. As below - thanks so much, I'm terribly sorry for having missed this when you sent it. Gmail must have labelled it as spam for some reason, because it simply did not reach me. Dottoressa is coming out in May!!! Good for you! A great accomplishment. Hip hip hooray!